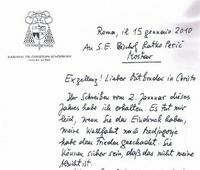 The German-language service of Vatican Radio has an article on Cardinal Schönborn’s private audience with the Holy Father last Friday, and the letter he faxed to Bishop Perić the same day. After his controversial pilgrimage to Medjugorje Cardinal Christoph Schönborn has apologized to the local bishop of the place, Ratko Perić. In a letter published in excerpts on the official home page of the Mostar diocese, the Vienna cardinal emphasizes that he had no intention of “harming peace.” Schönborn had visited the village of Medjugorje in Bosnia-Herzegovina at the end of the old year and argued for “an integration of the Medjugorje phenomenon into normal pastoral practice“. He had declared his visit to the ecclesiastically unrecognized site of Marian pilgrimages a private trip. However, he provided for considerable visibility to it in media publicity. The letter of apology is dated January 15, the day on which Schönborn was in Rome for a private audience with Pope Benedict. With his letter, Schönborn answered a letter from Perić, who had sharply criticized the visit of the cardinal to Medjugorje and emphasized that the visit implied no recognition of the “apparitions”. Furthermore he recalled that the so-called seers of Medjugorje had repeatedly manipulated the alleged Marian apparitions. With Schönborn’s letter the discussions are now considered closed, said a spokesman for the Mostar-Duvno diocese this Tuesday. — Since 1981, Marian apparitions are said to be taking place in Medjugorje. They are not recognized either by the local diocese or by the Vatican. and on the basis of the above words, countless messages go round the internet stating that Cardinal Schonborn has apologised to Bishop Peric! The Cardinal is sorry that the Bishop got a wrong impression of his visit to Medjugorje and the internet world portrays this as the Cardinal regretting some of his actions or even his visit! This type of thing is what must make Jesus and Mary cry. The Cardinal regrets that the Bishop has misunderstood his actions!! End of story. There is absolutely no apology here to the Bishop and those who suggest otherwise are living in a world of make-believe. Boy, what a passive-aggressive non-apology. Sad. Of course, when you feel you have a direct line to God through visionaries and a Mother of God whose appearance is at the whim of whichever visionary and thanks people for listening to her then I guess you might get the picture that you somehow know the mind of God. David, obviously something caused the cardinal to write something down and fax it to the Bishop of Mostar. The cardinal saw the need to take a step backward. Whether or not he regrets anything at all, this cardinal was forced to communicate with Bishop Peric in writing, and in something of a conciliatory manner. He backed down. I’m going to go out on a limb and say that phony apparitions — lies about our Lord Jesus Christ and about the Blessed Virgin Mary, told by disobedient lay people, coached by manipulative friars — displease them. In June of next year it will be 30 years since the Medjugorje fable began. How much more time will it be before the Vatican demands that Bishop Peric be honored by full acceptance of his and others’ statements that there is no evidence of positive supernatural activities taking place at Medjugorje. The Cardinal Schonbron “apology” will be given far less attention than the fact that the Cardinal went to the site as a “pilgrim”. That’s for you to answer Laurette. Why does the Vatican leave pilgrims free to visit Medjugorje after all this time? The answer of course is that the Vatican does not hold your views or those of Richard and other anti-Medjugorje people. And I think it likely that this will remain the position until events ultimately prove Medjugorje authentic to everyone, yes even you, Laurette, and Richard. The Vatican “allowed” it because the local ordinary, the Bishop of Mostar had not *dis*allowed it entirely. This falls under the principle of subsidiarity, where the bishop is the “ordinary” person to make those decisions. The Pope is not a general or CEO. Many times throughout history, the Pope has stepped in on a theological controversy, but only on last appeal. Notice that Lourdes was not “approved” by the Pope. Pope St. Pius X He let the judgment of the local bishop stand, and only “stepped in,” because he wanted a universal celebration. In Akita, the local bishop asked for help, and this was given. What this mean is that the Bishop does not think anything is going on, but was willing to allow pilgrims to come unofficially, i.e., under no Church approval, or any kind of implicit affirmation of a supernatural event. The Pope is fine with the Bishop of Mostar’s judgment. The Church has for the most part just shrugged on visions or dismissed them when forced, and Rome is not in the habit of stepping in. Let me add to Random Fr.’s observations, because the national bishops’ conference has been involved too. That would in effect bar all pilgrimages, because the concept of “pilgrimage” implies that one is traveling to an especially sacred place, such as a shrine or a saint’s tomb. In the case of Medjugorje, if there is no supernatural character to the events, then there is no “pilgrimage”. In 1986, Tarcisio Bertone, an archbishop and secretary at CDF, wrote in a letter of advice to a French bishop that there should be no “official pilgrimages to Medjugorje (understood as a place of authentic Marian apparitions)”. Supporters of Medjugorje have claimed exemption from restrictions since then on the grounds that all their activities are “unofficial”. After he left CDF, Abp. Bertone maintained his interpretation regarding “official” vs. “private” pilgrimages in his memoirs. Yet that distinction does not have a basis in any document of the Yugoslav bishops, as far as I can tell. I would go so far as to say that there is an apparent difference of interpretation between now-Cdl. Bertone and the local bishops. It wouldn’t be right to say that Bertone’s writing simply overruled the Yugoslav bishops, because CDF letters of advice are not intended to have authority on their own, but provide information and guidance on how to understand existing official declarations. In fact, secretary Bertone referred to declarations of the Yugoslav bishops as authoritative in his letters on the subject. Let us recognise that it is not easy to apply faithfully this recommendation. How, in fact, to organise a private pilgrimage without it being motivated by the conviction that the events of Medjugorje are of a supernatural origin? Since this conviction is at the origin of the pilgrimage, does not this latter not become de facto “an authentication of events in course which still necessitate an examination by the Church”?